Nimu Chilling Hydro Electric Project has been contemplated as a run of the river scheme situated in the Leh district of Jammu & Kashmir. 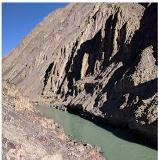 The barrage site is located on River Zanskar just before its confluence with the mighty Indus River. The Project will utilize a gross head of 45 m and design discharge of about 59 cumecs for generation of 24 MW. The Project comprises a 14.5 m high barrage, a rectangular fore-bay type power intake on the left bank, 5.6 m diameter horse shoe shaped head race tunnel of length 8.9 km, circular surge shaft of 22 m diameter & height 39.5 m, a single 200.0 m long 4.0 m diameter pressure shat/buried penstock, a surface power house housing 3 units of 8 MW. A 24 m long tail race channel conveys back into the existing reservoir of Nimo Bazgo HEP after power generation. Review of the PFR prepared by JKSPDCL. Review the Construction & Equipment Planning. Sankoo Hydro Electric Project has been contemplated as a run of the river scheme situated in the Kargil district of Jammu & Kashmir. The barrage site is located on River Suru. The Project will utilize a gross head of 58 m and design discharge of about 36 cumecs for generation of 19 MW. The Project comprises a 10 m high barrage, a rectangular fore-bay type power intake on the left bank, Surface de-silting basin, 4.5 m diameter horse shoe shaped head race tunnel of length 1.9 km, circular surge shaft of 16 m diameter & height 53 m, a single 157 m long 3.5 m diameter pressure shat/buried penstock, a surface power house on the left bank of River Suru housing 2 units of 9.25 MW. A 46 m long tail race channel conveys back into River Suru after power generation. AEMPL has been engaged to provide Engineering Consultancy Services for preparation of Detailed Project Report for Mangdum Sangra HEP, Kargil as per the guidelines of Alternate Hydro Energy Centre, Ministry of New and Renewable Energy, Government of India. Mangdum Sangra Hydro Electric Project has been contemplated as a run of the river scheme situated in the Kargil district of Jammu & Kashmir. The barrage site is located on River Suru. The Project will utilize a gross head of 82.76 m and design discharge of about 27.70 cumecs for generation of 19 MW. The Project comprises a 10 m high barrage, a rectangular fore-bay type power intake on the left bank, Surface de-silting basin, 4.0 m diameter horse shoe shaped head race tunnel of length 2.8 km, circular surge shaft of 10 m diameter & height 54 m, a single 358 m long 3.10 m diameter pressure shat/buried penstock, a surface power house on the left bank of River Suru housing 2 units of 9.5 MW. A 60 m long tail race channel conveys back into River Suru after power generation. AEMPL has been engaged to provide Engineering Consultancy Services for preparation of Detailed Project Report for Durbuk Shyok HEP, Leh as per the guidelines of Alternate Hydro Energy Centre, Ministry of New and Renewable Energy, Government of India. Durbuk Shyok Hydro Electric Project has been contemplated as a run of the river scheme situated in the Leh district of Jammu & Kashmir. The barrage site is located on River Shyok Gong/Tnagtse Nala which is the left bank tributary of the Shyok River. The Project will utilize a gross head of 221.5 m and design discharge of about 12 cumecs for generation of 19 MW. The Project comprises a 12 m high barrage, a rectangular fore-bay type power intake on the right bank, 3.0 m diameter horse shoe shaped head race tunnel of length 5.2 km, circular surge shaft of 6 m diameter & height 65.15 m, a single 940 m long 1.75 m diameter pressure shat/buried penstock, a surface power house on the left bank of River Shyok housing 2 units of 9.5 MW. A 75 m long tail race channel conveys back into River Shyok after power generation. AEMPL engaged to provide Engineering Consultancy Services for the Review and Preparation of Detailed Project Report of Bhilangna-IIB Small Hydroelectric Project. Bhilangna-IIB SHEP is being developed by UJVN Limited, a Government of Uttarakhand enterprise.The project is proposed as a run-of-river scheme on the river Bhilangna in Tehri Garhwal District of Uttarakhand. The project envisages construction of an ungated ogee weir across Bhilangna River to divert 24.93 cumecs flow into a water conductor system comprising Head Race Tunnel of size 3.5m, Horse-shoe shaped and 2.07km long; Surge Shaft of 11.0m dia and 38m high; Pressure Shaft of 2.8m dia and 62m long, Buried Penstock of same size and about 247m long, Branch Penstock of 1.6m dia and 35m long each and a surface Power House of size 45m (L) x 12.5m (W) x 27.0m (H) housing total three generating units of horizontal axis Francis Turbines. The flow after generation shall be diverted into River Bhilangna through a 6m wide tail race channel. AEMPL engaged to provide Engineering Consultancy Services for the Review of Project Parameters and Design & Detailed Engineering Work of Penstock/ Pressure Shaft of Sorang Hydroelectric Project. Sorang Hydro Electric Project (2x50MW) is being developed by Himachal Sorang Power Private Limited (HSPL). The project was awarded to HSPL by Himachal State Electricity Board (HSEB). The project is located on Sorang Khad, a right bank tributary of the River Sutluj near Sorang Dongri Village in Kinnanur District of Himachal Pradesh. The project envisages construction of a trench weir across Sorang Khad to divert 17.34 cumecs flow (2 units) into a water conductor system comprising Head Race Tunnel of size 3.2m x 4.0m, D-shaped and 1.45km long; Surge Shaft of 6.5m dia and 56.1m high; Surface Penstock of 3.25m dia and about 826m long followed by a steel lined Pressure Shaft of about 287m long and an underground Power House of size 79m (L) x 16.5m (W) x 39.5m (H) housing total three (presently two) generating units of Pelton Turbines. The flow after generation shall be diverted into River Sutluj through a 4.5×5.0 m D-shaped, 166 m long tail race tunnel. Chatten Small Hydro Electric Project has been contemplated as a run of the river scheme situated in the Chatten Village, Mangan District, North Sikkim. The trench weir is located across Chyagachu River. The Project would utilize a net head of 258.74 m and design discharge of 1.5 Cumecs for generation of 3 MW. The Project comprises of trench weir, 1 No. of intake channel along with De-silting arrangement on right bank of Chyagachu River, one number of head race pipe of 800mm (ID), 4m diameter surge tank, 1 no. 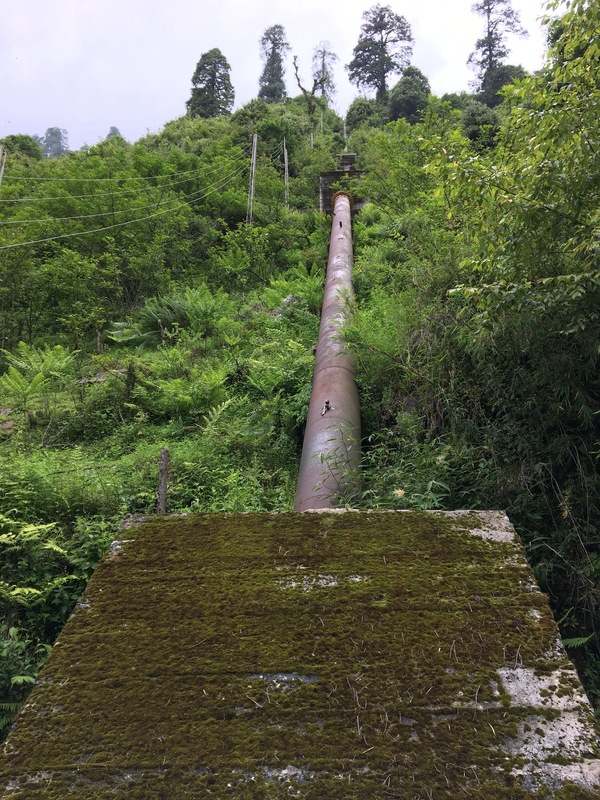 of 429m long main surface penstock which bifurcates into two numbers of 40m long branch penstock, Surface power house housing 2 units of 1.5 MW and 1 No. of 1.5 (W) x 1.2 (H) m rectangular-shaped, 110m long Tail Race Channel. Copyright © 2019 Home. Powered by Vibgyor technosystems.